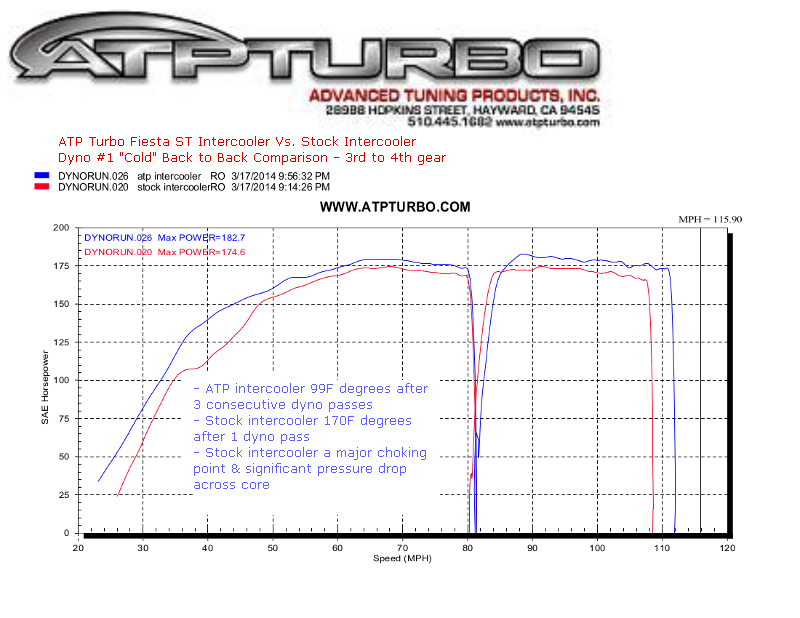 ATP Turbo Front Mounted Intercooler Kit, 2014 Fiesta ST Turbo 1.6L, with 450HP Garrett Core. Utilizes Garrett's High Density Bar and Plate Core with nice cast ATP endtanks. Perfect fit into the stock location and clears the bumper beam and bumper cover nicely with no cutting. There is no cutting of any kind. Performance Gain Notes: During the testing phase, we quickly discovered (to our surprise) that the stock intercooler on the 2014 Fiesta ST Turbo was quickly becoming a "bottleneck".... long before we expected it to. Our replacement unit makes instant power right off the bat by unleashing the full flow of the turbo. Shortly after doing the ECU flash to increase boost and then bolting the 3" downpipe to help the turbo exhale, we discovered the data collected had suggested that there was a choking point in the system was becoming apparent. We found that not only did the stock intercooler not keep up with its thermal duties (as seen in the rise in charge air temps), we also observed that it could not keep up with flow-thru duties, thus causing a severe pressure drop across the core and limiting ultimate flow and HP. This had to be addressed before further "unleashing" of anymore power on this powerplant. The unit regains the pressure drop across the core from almost 3 psi at full pressure on the stock core and takes it down to an almost 0 psi pressure drop on the Garrett core. This translates directly to power into the engine by allowing all of the air to get past the intercooler core and into the engine. See dyno graph! Furthermore, the density of the Garrett core is so great that it blows the stock core away in the area of thermal efficiency. The stock core is so bad, that after one single 3rd to 4th gear pull on a cold engine, the IAT will exceed 170 degree F. That is a lot of power robbing heat that remains for as long as you drive the car. The same test done on our 450 HP core, kept the IAT temps barely above ambient and less than 99 degree F under the same test conditions. 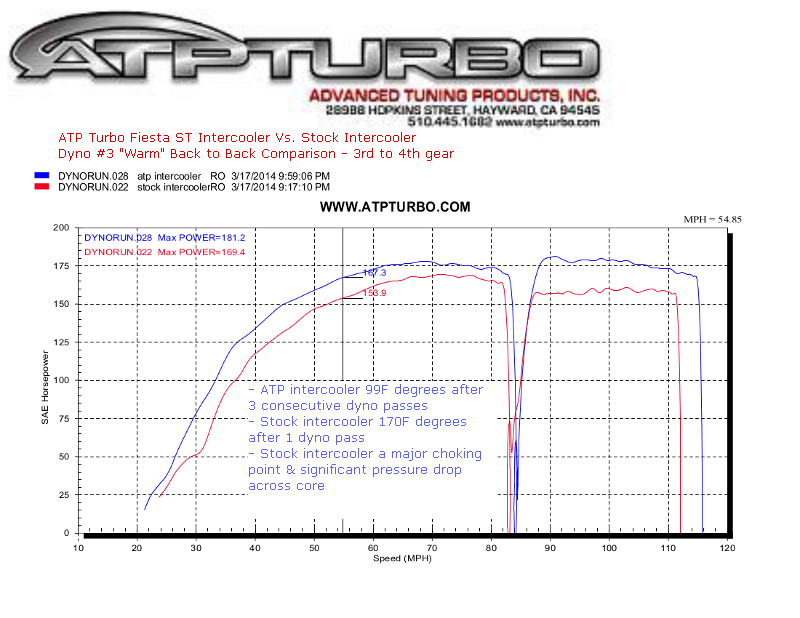 See dyno graphs done back to back while the car was strapped to the dyno for an intercooler hot swap test. Over 30 more HP is available on tap just from having a cooler charge alone! The Garrett 450HP core assembly is relatively large, but it fits right into the same space. It's not ridiculously large where it would require a hacking of the front end to install. It's also not needlessly large enough to hurt throttle response. It happens to fit the bill perfectly for the mild to wild Fiesta ST and will happily support thermal and flow duties from the stock turbo all the way up to 450HP GTX applications. Ships in 7-14 Days Free Shipping.